Sherlock - Science vs. Story? Story plus worke that influenced forensic science, detective work, and criminal investigations -- all laid out in A Study in Scarlet. According to our Book Leader Leslie VonHolten, Sir Arthur Conan Doyle (in the Sherlock Holmes stories) combines literary interest in human interactions with the data-collecting and problem-solving needs of the scientists among us. I am fortunate to share a neighborhood block with three science professors. I’m a to-the-bone arts and humanities gal, and to say we have different world views would be an understatement. Not surprisingly, we rarely agree on books. I am a fiction reader interested in the ways characters interact, those squishy emotional areas full of nuance and interpretation. Scientists, they like problems that can be solved—elusive but good, hard facts. On this point, I again marvel at the skill of Sir Arthur Conan Doyle. In the Sherlock Holmes stories, he combines my literary interest in human interactions with the data-collecting and problem-solving needs of the scientists among us. As a trained physician, Conan Doyle used science to make his fictional Sherlock Holmes unique among other literary heroes of the time. By placing humanities and science hand-in-hand, he not only revolutionized literature, but also greatly influenced forensic science, detective work, and criminal investigations. It’s all laid out in the first Sherlock novella, A Study in Scarlet. Dr. Watson marvels as he watches the great detective sniff the dead man’s lips, inspect the soles of his shoes, and use a measuring tape and a magnifying glass. How odd. Hence readers in 1887 learned of a new approach to criminal investigations. Before A Study in Scarlet, police used eye-witness accounts and confessions to solve crimes. Today we accept that such reliance is flawed—witnesses don’t always see what they think they see, and confessions are sketchy. What we demand in our courts today are facts to back up the stories. Evidence. The kind Sherlock Holmes collects. There are many articles online that trace the Sherlock Holmes stories to the techniques of today’s forensic investigators. PBS has a fascinating 2-hour special called “How Sherlock Changed the World,” which explores how Sherlock impacted today’s crime-scene investigations. 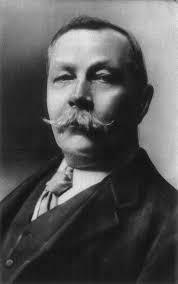 Among Conan Doyle’s contributions to forensic science: Changes to the approach of a crime scene, the use of fingerprint analysis, the use of “reasoning backward” to figure out the timeline (and sometimes motive), handwriting analysis, and a focus on footprints. Although Conan Doyle was the first to get these ideas into the mainstream, they were certainly being discussed in his social circles. That said, he was on the cutting edge and likely influenced his peers in the sciences. He studied under Dr. Joseph Bell, a surgeon in Edinburgh and the inspiration for the Sherlock Holmes character. Bell often helped with local police investigations, and he even contributed an analysis of the Jack the Ripper murders in London. Hans Gross of Austria is considered the father of criminal profiling, and his 1893 book, Criminal Investigations, promotes the study of psychology, chemistry, physics, botany, secret codes, and blood—skills Sherlock Holmes exhibited six years earlier. And Edmond Locard, a French criminologist and the father of forensic science, pioneered the Locard’s Exchange Principle that asserts that “every contact leaves a trace.” He eventually established the first professional forensic crime lab—much like what Sherlock had in his own home—in 1910. Twenty-three years after A Study in Scarlet. So perhaps someday my scientist neighbors and I will find common ground. I will propose that we start with a Sherlock Holmes book club. In 1987, Texas inmate Steven Mark Chaney was sentenced to life after a dental expert testified that his teeth had caused marks on the arm of a murder victim. This same expert has now repudiated his testimony as unfounded, reports The New York Times. More than a dozen Americans have now been exonerated in cases involving debunked bite-mark testimony. And Texas is leading the way in this little-recognized corner of forensics.